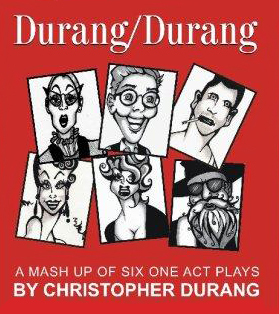 Bad Habit Productions Presents "Durang/Durang"
Bad Habit Productions, dubbed one of Boston’s Best Small Theatre Companies by WBZ, will present an evening of Christopher Durang comedies in the "theatrical mash-up," "Durang / Durang," from December 2 - 12. Performances will take place at the Durell Theatre, in the Cambridge YMCA at 820 Massachusetts Avenue. Steve Kleinedler directs. “Act 1 is theater parody; Act 2, is not.” With these words, Christopher Durang launches the audience into a myriad of comic circumstances. Enjoy an upside down satire of Tennessee Williams’ "The Glass Menagerie" followed by a fusion of David Mamet and Sam Shepard. In Act II, struggle with Nina, whose facelift has fallen, and suffer through a visit with your ex before attending a business lunch at The Russian Tea Room. The company includes Shelley Brown, Mike Budwey, Mack Carroll, Erin Gilligan, Jenny Gutbezahl, Julie Jarvis, Sheryl Johns, Silas Lohrenz, Joseph O'Connor, Heather Peterson, Lena Raff, Chelsea Schmidt, and Jonathan Welch. The award-winning Durang is also the author of "Sister Mary Ignatius Explains It All For You," "Beyond Therapy," "Baby With the Bathwater," "Miss Witherspoon," "The Marriage of Bette and Boo," "Laughing Wild," and "Betty's Summer Vacation." For tickets and information, visit www.badhabitproductions.org.